I like to cut and paste: Get Your Spook On! 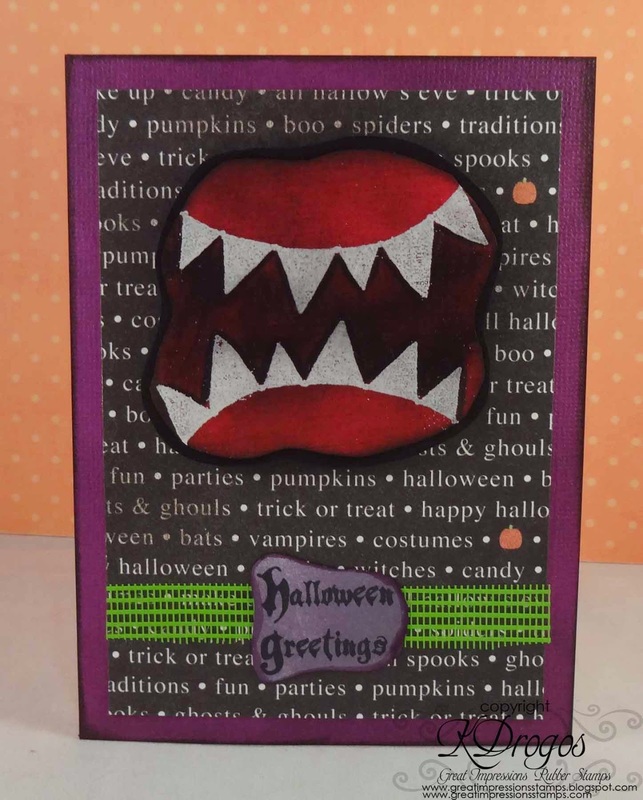 For this Halloween card I used E846 Flag Banner and A134 Halloween Greetings. One day I looked at Flag Banner stamp-and it must've been upside down because I thought hmmm that looks like it could be teeth. I used white embossing powder and black ink on a piece of red cardstock. I love when can do a different design with my stamps. The sentiment and green mesh completes this card. I hope you join our challenge! For more inspiration be sure to check us out on Facebook and Pinterest. And to do some shopping go here! For orders in the US $25 and over---shipping is free! This is AWESOME!! I love it!!!! I LOVE THIS CARD. The flag banner teeth are just bloody brilliant. The simplicity of the design and the modern abstracty feel to it totally, totally work! KUDOS to you Katy! Such a fun Halloween card! LOVE it.